Well unless there's some medical issue or something seriously impeding your ability to live with someone else you're going to have to tough it out. We've all been there before, some have had better experiences than others but you push through it. At least one year of otr is recommended before moving on to something else, especially o/o stuff which is another story. I do miss some aspects of otr but this is not one of them. It's a bone chilling 50 degrees out right now and I'm on the couch. Be safe out there drivers. Close to the GA boarder you say? I used to stay by the boarder myself off 85. Hometime wasn't a problem. But let's clear one thing up, no recruiter can guarantee you anything. They're in an office behind a desk being paid to recruit you. I'm not saying the company won't try and deliver on those promises but nothing is written in stone when it comes to some things. As far as pay goes, I'm not sure how McElroys works so I can't say for sure, but Maverick has everything posted on their website. They have single bunk midroof sleepers for solo drivers and condos for trainers. 2 excellent choices to start off flatbedding. As far as which one is better, do you like red trucks or maroon? I don't believe there's a clear winner here, it depends on which suits you better. I was with maverick for 2.5 years, nothing bad to say about them. They're not perfect obviously but they did what the recruiter told me they would. I will mention that they have some of the nicest equipment for flatbed amongst the major players. Not sure how McElroys trucks and trailers are outfitted but Maverick had newer trucks and trailers. Everything will really depend on where SC you are. If you're close to the coast, home time will be an issue, with Maverick anyway. Parrot may be lurking sonewhere, he's the McElroy expert around here. I'll be glad to answer any questions when I can. We can't really tell you what's best because only you know your situation. Some people recommend getting some dry van experience before trying another style of trucking. Like turtle said, I'd only pulled flatbed before I came to FedEx. I enjoyed the hours the most, being outdoors and the challenge of each load. Dry van may be more straight forward but it's no piece of cake either. Decide what you're looking for in home time, pay, equipment, area of operation, etc and go from there. Well I'm a road driver, not sure what you city slickers are up to. But there's always dock work available. I've only been with FedEx a few months but there's plenty potential here. There are guys here that do very well for themselves. Ltl is definitely an upgrade. Absolutely not. Not only is it extremely dangerous, you can also get a ticket. An officer can wake you up and tell you to move anyway. Best thing you can do is plan ahead and park it early if you must to make sure you get yourself a spot. I don't know ow what you haul or what hours you operate but I'd avoid ramps for sure. Hey guys, hope everybody is warm and safe for the holidays. Just wondering who, if any, of you guys are working further holidays. I know trucking doesn't stop for holidays but most carriers do try to get people home I hope. I also understand some people don't have care and will work when work is available. As for me I got a nice 4 day weekend with the family. How boutique you guys? Are you working, willing to work or want that time off? Hello and welcome aboard. You can't go wrong with either company. Really depends on what you want to haul and where you want to run. Also it depends on how often you want to be home. If you want more home time options, I'd go with Maverick. I drove for them for 2.5 years, great company. They have regional flatbed, otr flatbed, otr reefer, regional glass and or glass as well as boats. Prime doesn't offer as much home time I don't believe but you will see more of the country there. They run all 48 if I'm not mistaken. Mavericks glass does 48 and Canada I believe. Flatbed is mostly east of i35. As far as getting your cdl, both have cdl sponsorship programs. Prime's is more refined since Maverick hasn't been doing it very long. 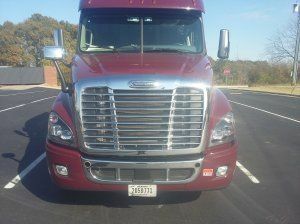 They will send you to a local school in little Rock to obtain your cdl, and I believe prime is all in house. There are plenty prime drivers here and a few current maverick drivers, so feel free to ask any questions. Honestly man your best bet is to call them and try and leave in good standing. When I was there I never missed work, always on time and did my job. Anytime I called and needed time away from the truck, they made it happen. You never know what they can do for you unless them call and ask. Like I said before, I believe they offer 30 days of absence. If you did that, maybe you could come back for a little while and put in a notice. Also, I'm not sure about tcd, but on the flatbed side money was no issue. I Never needed the guarantee as I exceeded it with ease. I don't want to jump on your case or anything but I gotta defend maverick here even though I left the company. Well as you said, they do pay for the bus ticket or will refund you the cost. You may want to get the procedure done while you're employed to help with cost. The COBRA coverage is a joke and ridiculously expensive. Even if you lose your truck, unless you got one of those nice brand new ones, they're all pretty much the same. Not sure where you're getting the hundreds of dollars from, only cost me about 60$ in gas to get home. They had me DH to the nearest terminal under a load to have it repowered. I cleaned it out, turned in my keys and badge and that was it. Yo you're with maverick still right? I just left a month ago, had no issues at all. Best thing you can do is call your FM and explain the situation. They do offer 30 days of absence I believe but it's unpaid. Not sure where the closest terminal to you is, but you should drop it off there for sure. I had my wife pick me up and we drove home. Be sure to clean your truck out the best you can. Thanks turtle, I'm still a skateboarder at heart lol. And bobcat yes, we work the dock plenty. It's mostly the lower guys such as myself on the line haul side. Drivers with bids or higher on the extra board may do an hour or so on the dock till their back haul is ready. I'm literally the last guy so I do more a good mix of shuttles and dock. Not sure about the city drivers. Hey what's going on everyone. It's been a while since I've posted here but I have been lurking. Anybody remember me? Anyway, a lot has happened in the last month or so since I was an active member. I am no longer with Maverick Transportation. My situation at home changed and being over the road, even 5 days at a time was no longer doable for me. I have nothing bad to say about the company. I worked there for 2.5 years as my 1st driving job and they delivered on everything I had hoped for. I left about a month ago on good terms and was told I'd be more than welcome to return if I wanted to. I took my time and made sure I had a job lined up prior to leav. I ended up going with FedEx Freight. The ltl biz is an entire different world from flatbed. I now work the dock and pull doubles, which can be a challenge. I'll try to make a new thread for FedEx at some point or add to an existing ltl thread. If anybody wants any information on Maverick or FedEx let me know.